Annakai 早川 Geshlider watches words scrape / lift / sway / stick / smash / rot / prank / feed. a fan of gabbing, silence, bittermelon, & jokes, she wonders: when old words won’t do the trick, then what? how to sprout, cross out, unmake? wonder: how to remember, plus forget? wonder: how can word: move through breath, limb? wonder: scrap all that: what’s left ta say? Dina Abdulhadi is a photographer, writer, and ex-scientist born and raised in Georgia. She first became a scientist in her high school's darkroom, making images appear on blank paper with strange chemicals that dyed her fingers yellow and made her feel like a magician. After working in academic and government laboratories, she’s returned to using words and images as her main incantations. She currently lives in Brooklyn and works for the Scholastic Art and Writing Awards. 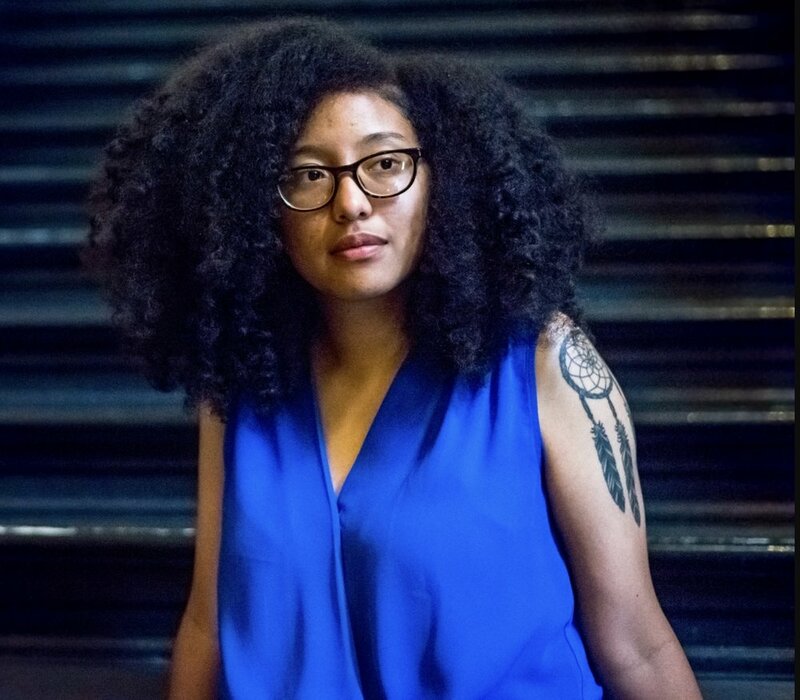 Naima Coster is the author of Halsey Street, a story of family, loss, and renewal, set in a rapidly gentrifying Brooklyn (January 2018, Little A). The recipient of numerous awards, her work has appeared in the New York Times, Arts & Letters, Kweli, The Rumpus, Aster(ix), A Practical Wedding, Catapult, and Guernica, among other places. Naima is a teacher of writing and has worked with students in a range of settings, including youth programs, prison, and universities. She tweets about literature, culture, and justice as @zafatista, and she writes the newsletter, Bloom How Must. 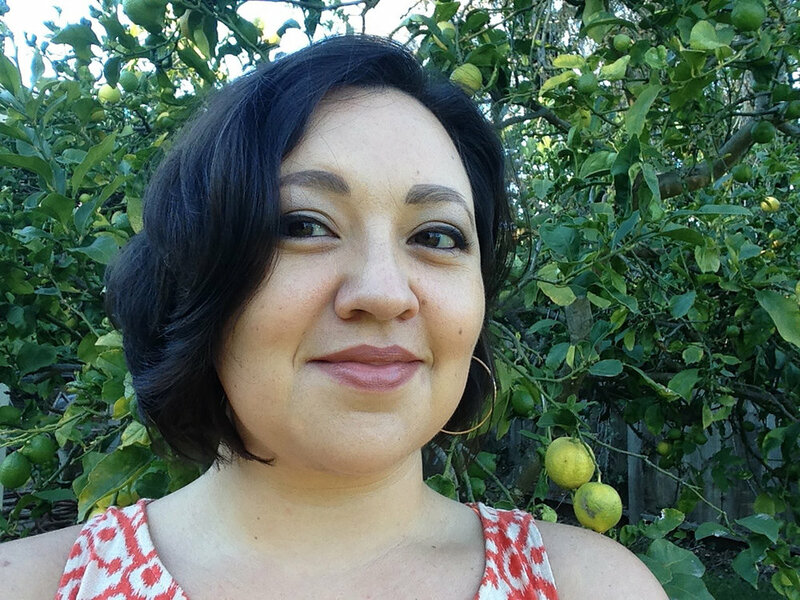 Estella Gonzalez was born and raised in East Los Angeles, which inspires most of her writing. Her work has appeared in Puerto del Sol, Kweli, Aster(ix) and Huizache and has been anthologized in Latinos in Lotusland: An Anthology of Contemporary Southern California Literature and Kaleidescope: Martindale Literary Award Winners 1988-2006. She received a Pushcart Prize “Special Mention” and was selected a “Reading Notable” for The Best American Non-Required Reading. Tracey Lewis-Giggetts is a professor of English and Creative Writing at the Community College of Philadelphia and founding publisher of NewSeason Books and Media, an independent press and content creation company based out of the metro Philadelphia Area. She holds a Bachelor of Arts degree in Communication from the University of Kentucky, an M.B.A. in Marketing from Montclair State University; an M.F.A in Creative Writing from Fairleigh-Dickinson University. From 2012 to 2014, this Louisville, KY native served as the Managing Editor at CLC Publications. There she was involved in shaping the work of numerous high profile writers. As a writer, Tracey has published an award-winning poetry collection and is the author of nine other books including a collection of essays, Diaper Bags and Church Shoes, and a novel, The Search for Susu (co-authored with Dr. Marcella McCoy-Deh). Additionally, Tracey's writing has been published in print and online publications including Kweli Literary Journal, The Guardian, The Chronicle for Higher Education, Philadelphia Weekly, Ebony Magazine, TheRoot.com, and more. Tracey is also a 2016 alumnus of the Zora Neale Hurston/Richard Wright Foundation’s Summer Writing Workshop. She was mentored by Elizabeth Nunez. In early 2017, Tracey wrote and directed her first short film, The Reunion, expanding her work to include visual storytelling. She is currently developing her second short film, Generational. Bahar Mirhosseini has worked as a public defender in the U.S. and with public defenders overseas. She is a VONA alum and a recipient of Hedgebrook’s Women Authoring Change Fellowship, one made in honor of Libyan lawyer and activist Salwa Bugaighis. During law school, she received the Haywood Burns Fellowship in Civil and Human Rights from the City University of New York School of Law. Bahar was first introduced to Kweli Journal during a fifth anniversary reading series the journal hosted with Jennine Capó Crucet in East Harlem, New York. She is working on a collection of short stories and a memoir. Ruth Mukwana is a fiction writer from Uganda. She is currently working for the United Nations on humanitarian affairs in Sudan. Mukwana completed her MFA in Creative Writing from the Bennington Writing Seminars in June of 2014 and is finishing her collection of linked short stories. Her short story, The Smell, was published by Solstice Magazine. Her short, Taboo, was runner up for the Black Warrior Review 2017 Fiction Contest, and her story, The Minister, is forthcoming in the 10th Anniversary issue of Consequence Magazine. Princess Perry was born in Newport News, Virginia. She is a past winner of the Zora Neale Hurston/Richard Wright Award and a Virginia Commission for the Arts grant. Her short stories have appeared in African- American Review and Harrington Gay Men’s Literary Quarterly. She lives in Norfolk, Virginia. In September 2014, her story "A Penny, A Pound" was published in the anthology All About Skin: Short Fiction by Women of Color (University of Wisconsin Press). She is working on her debut novel. “Namrata Poddar writes fiction, nonfiction, and teaches transnational American literature at the University of California, Los Angeles. Her work across genres explores the intersection of power, privilege and storytelling via race, class, gender, place or migration. As a scholar, her writing has focused on maritime sites (boats, ports, beaches) and stories of global travel, environmentalism and tourism in small islands. Her research has appeared in English and in French in different journals or special issues on the Caribbean, the Pacific and the Indian Ocean across the world. Her creative work has appeared in Transition, Literary Hub, The Margins, The Progressive, CounterPunch, Los Angeles Review of Books Quarterly, Hayden's Ferry Review, Necessary Fiction, Resilience, The Feminist Wire, The Caravan and elsewhere. She holds a Ph.D. in French Studies from the University of Pennsylvania, UCLA Mellon Postdoctoral Fellowship in Transnational Cultures and an MFA in fiction from Bennington Writing Seminars. More at www.namratapoddar.com. Anna Qu was born in Wenzhou, China and grew up in New York. Her nonfiction has appeared in Kweli, The Threepenny Review, Vol.1 Brooklyn, Kartika Review, X0Jane.com, Jezebel.com, and Free Range Nonfiction. She holds an MFA in nonfiction writing from Sarah Lawrence College and spent two years working in publishing. Currently, she is working on a memoir and lives in Brooklyn. Jodi M. Savage is an employment discrimination and disability rights attorney. Jodi writes about race, gender, feminism, faith, and Alzheimer’s disease. Her nonfiction has appeared or is forthcoming in Catapult, The Establishment, and Women’s Studies Quarterly. Cynthia Dewi Oka is the author of Salvage: Poems (Northwestern University Press, 2017) and Nomad of Salt and Hard Water (Thread Makes Blanket, 2016). Her work has appeared in ESPNW, Hyperallergic, Guernica, Poets.org, American Poetry Review, Kenyon Review, The Massachusetts Review, Painted Bride Quarterly, and elsewhere. She is a contributor to the anthologies Women of Resistance: Poems for a New Feminism (OR Books, 2018), Who Will Speak for America (Temple University Press, 2018), and What Saves Us: Poems of Empathy and Outrage in the Age of Trump, edited by Martín Espada. Her work has also been selected for the Best of Kweli: An Aster(ix) Anthology (Blue Sketch Press, 2017), edited by Angie Cruz and Laura Pegram. As a 2017 Leeway Foundation Art and Change Grantee, she partnered with Asian Arts Initiative to create Sanctuary: A Migrant Poetry Workshop for immigrant poets based in Philadelphia. A three-time Pushcart Prize Nominee, she has received scholarships from VONA and the Vermont Studio Center, the Fifth Wednesday Journal Editor's Prize in Poetry, and the Leeway Foundation's Transformation Award. She is originally from Bali, Indonesia. Vincent Toro has an MFA in poetry from Rutgers University. He is winner of the 2015 Sawtooth Poetry Prize and is recipient of both a Poet’s House Emerging Poets Fellowship and a New York Foundation for the Arts Fellowship in Poetry. His poems have been published in Kweli, The Buenos Aires Review, The Acentos Review, Codex, The Journal, Matter, The Ostrich Review, The Cortland Review, The Caribbean Writer, and in the anthologies CHORUS, and The Waiting Room Reader 2. His play “21” won the Metlife Nuestras Voces Playwriting Award and was staged at the Spanish Repertory Theater. From 2006-2011, Vincent was Theater Arts Director at the Guadalupe Cultural Arts Center. During his tenure there he won The San Antonio Theater Councils Golden Globe for Direction of a Drama. He is a member of the Macondo Writer’s Foundation and serves on the board of GlobalWrites, a non-profit dedicated to promoting literacy through integration of technology and performing arts in schools throughout the U.S. Vincent teaches at CUNY’s Bronx Community College and is a poet in the schools for the Dodge Poetry Foundation and the Dreamyard Project. His collection, “Stereo.Island.Mosaic.” was released in January 2016 from Ahsahta Press. Di Jayawickrema is a communications specialist and writer. Currently based out of D.C., she has 8+ years of experience as a marketing/communications specialist in diverse for- and non-profit environments. She was the former Director of Marketing & Commmunications at Educational Alliance’s Manny Cantor Center and currently consults for literary, arts, immigrant and racial justice advocacy causes and other progressive nonprofits. Her fiction and prose poetry have appeared in Unbroken Journal, Ginosko Literary Journal, Fiction Fix, and The Albion Review. She holds an M.B.A. in Marketing and a B.A. in English Literature/Creative Writing.